From the Baldwin County Courthouse, go west on Hancock Street for 2 blocks or 0.2 mile (or the one large block containing Georgia College & State Univ.). Turn right on Clarke Street. Go one large block or 0.2 mile. Turn left onto Highway No. 22 west (Montgomery St.). Go 5.0 miles. Turn right on Old Monticello Rd. Go 4.5 miles on Old Monticello Rd. Turn left on Cox Rd. Go 1.3 mile. Cemetery is 500 feet off Cox Rd on the right, before reaching the driveway to 256 Cox Rd, and on the rise. 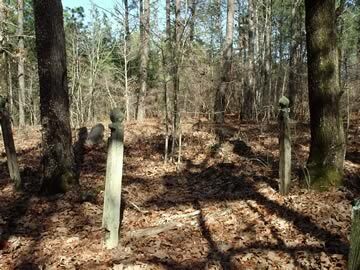 The cemetery has the remains of a wooden fence around it. "Mark the perfect man and behold the upright for the end of that man is peace." All info per TT. Grave not found in 1999. Aged 15 months. All info per TT. Grave not found in 1999. Unmarked Grave - L. M.
A footstone at the end of a brick slab. Probably marks Lueco Moore's grave, with original marker moved from this slab. 4 visible graves in all in this cemetery.